The new cartography is about much more than just land! In 150 infographic maps of Portland, Oregon, two leading geographers explore unexpected topics like city chickens, wild coyote encounters, food-truck trends, and coffee culture. Modern cartography tells the hidden stories of Portland in these fascinating and colorful infographic maps. When mapmaking takes on nontraditional topics like patterns of graffiti, locations of strip clubs, or even which neighborhoods favor which house colors, finding your way around the city takes on a whole new meaning. Each map starts with the gathering of at least one data set about a given topic, then translating that to a visual format that blends traditional cartographic skills with modern graphic design. David Banis has managed the Center for Spatial Analysis and Research in the Geography Department at Portland State University since 2006, working with a wide variety of partners at the federal, state, and local levels. His work explores the diverse ways that cartographers can tell stories with maps, focusing on the mapping of nontraditional subjects. Hunter Shobe is a cultural geographer and assistant professor at Portland State University. He holds a PhD in Geography from the University of Oregon and has over fifteen years of experience researching the cultural, political, and economic dimensions of how people connect to places and environments. "[Portlandness] suggests that when we let go of our biases and set off on the city streets, we will stumble upon a Portland we barely imagine." 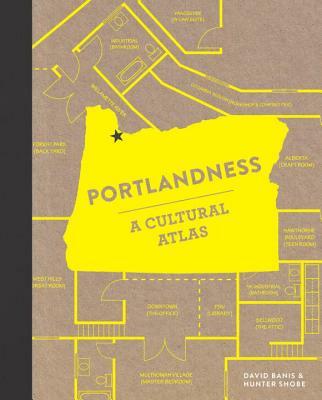 "Portlandness: A Cultural Atlas should be required reading for newcomers and natives alike." "Portland State University geography professors Banis and Shobe tap into the popularity of the TV show Portlandia with this entertaining and educational reference." "Is there a Portland state-of-mind? Is there a way to objectively look at the peculiar state of being that seems to be Portland, here in the 2010's, and lay it all out for you, comprehendably? If there is, Portlandness: A Cultural Atlas comes as close as anything can at the moment...a witty, earnest look at what it means to be Portland right here, right now."